OSUG's Special 2 Day event! This 2 day event also included a continental breakfast, donuts & muffins, tea / coffee / juice and a delicious afternoon snacks - courtesy of Appeon Coporation. The OSUG group would like to thank Mr Armeen Mazda (CEO of Appeon) and Anne Bataille of Novalys Coproation for attending & presenting at this event. OSUG would also like to thank Anthony Robinson and Tony Antonello of SAP Canada for arranging the meeting room and providing the projector. 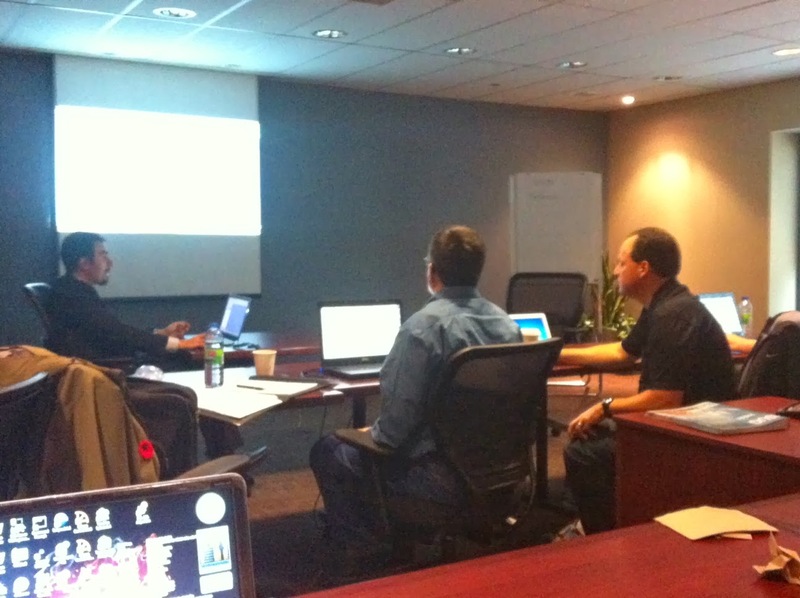 The Ottawa Sybase User Group’s last meeting was on Oct 31 and November 1, 2013. 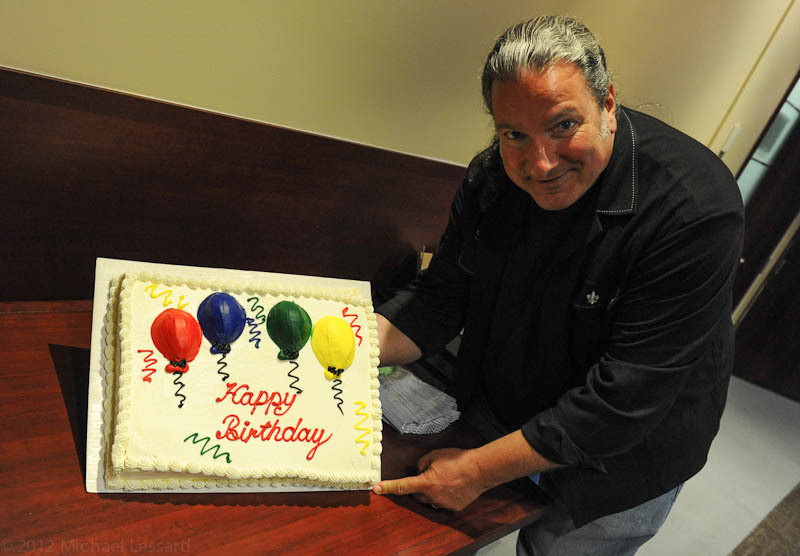 This was a special meeting as it also coincided with OSUG’s 21th birthday this year. The group was originally founded by Chris Pollach who at that time worked for the local Ottawa, Canada PowerSoft distributor & education partner - AJJA Information Technology Consultants. Chris commented that this was also his last year with the ISUG-Tech organization - serving the past two years as its VP of membership. During Chris Pollach’s “Technology Watch” segment that preceded the formal OSUG meeting agenda – Chris shared the latest PB & ISUG-Tech news. He then covered the latest STD Foundation Classes highlights for PowerBuilder 12.1/12.5.1 and Appeon 2013 with all its new and exciting features. President Chris Pollach opened the meeting and first of all thanked Sybase Canada’s technical director Tony Antonello for his two decades of support for the OSUG user group. According to Chris, Tony epitomizes all the best things any software vendor employee has done to help facilitate the user group’s success over the past 21 years! Chris then proceeded to also thank Sybase employee Anthony Robinson for his continued support of OSUG presenting high quality information about the various Sybase products. Chris also thanked CEO Armeen Mazda of Appeon who had returned to Ottawa for his fourth visit and Ms Anne Bataille from Novalys who flew in for the OSUG meeting all the way from Paris France. Armeen Mazda speaking about Appeon Mobile. The first presenter of the day was the CEO of Appeon Corporation - Mr Armeen Mazda. Armeen took the OSUG members through the highlights of the German PB User Meeting where SAP announced the official support of PB and the introduction of PB 15 beta. He also focused on the messages delivered at the German UG from SAP and from his meeting with SAP senior management at SAP's TechEd conference in Las Vegas in October. The next segment of his presentation focused on the exciting features of the up coming in Appeon Server release 6.8 and Appeon Mobile 1.5. He then presented a detailed the development road map for Appeon Server 7.0 and Appeon Mobile 2.0. Armeen continued after the latest PB News segment to present an overview of Appeon Web and Appeon Mobile. These presentations took the attendees through the architecture of the products, how they interact with PowerBuilder Classic. He then presented the new Appeon Mobile 2.0 product that will be released into beta in December 2013 and how this version will support the Android devices equipped with version 4.0 or higher of the Android O/S. Anne Bataille speaking about Novalys's products. The first presentation on OSUG’s afternoon agenda was made by Anne Bataille from Novalys France. Anne’s presentations focused on the Novalys products that enhance the PowerBuilder ecosystem. These products included Visual Expert, PB Report Writer, Enable and Visual Guard. After the product overviews, Anne took the OSUG attendees through a detailed review of the new Visual Expert version 7.0. VE7 is a complete rewrite of the Visual Expert software tool and includes many new customization features than the previous release. The last presenter of the afternoon on Day #1 was Chris Pollach who let the OSUG members through a detailed review of the new Foundation Classes. The FC's were originally written in 1992 by Chris that expanded in later years to include EAServer, PocketBuilder, PB Client/Server, PB.Net Web Services and and Appeon. The latest release of the FC's is a major update that sees these independent product streams of the FC's merged into one "integrated" set of classes for all the above products. This now makes it much easier for PB developers to build PB applications that can be deployed as Win32, .Net, Web, Web Services, Mobile, etc in nature - all from one common framework source code. The other main benefit is the fact that Chris no longer needs to spend extra time maintaining parallel code bases of the FC's, Thus, making his time to maintiain and enhance the FC's more effective. At the end of Day #1, the attendees and presenters were treated to full question and answer session on the days presentations. This proved to be a great wrap up for the attendees on all the interesting information that they had received on the first day. The second day of the OSUG PB World Tour event meeting was entirely focused on detailed technical presentations and hands-on workshops on the primary products presented on Day #1. This gave the presenters from the previous day the opportunity to focus on a specific product. For Anne Bataille, it was Novalys' brand new Visual Expert version 7.0 software; for Armeen - Appeon Mobile 1.5 which was just released and Chris Pollach's brand new "integrated" Foundation Classes. All three presenters were able to give each OSUG attendee a copy of their software which would allow then to use it for free! The first presenter on Day#2 was Anne Bataille who first walked everyone through installing and activating the Visual Expert v7.0 product. Once everyone had VE7 up and running on their lap-tops, Anne walked the audience through its use on a real PowerBuilder application. From there, Anne was able to allow every attendee to use VE7 on a PB application of their choice. She was even able to demonstrate VE7 using one of the attendees actual PB application's - which was quite large! Anne was then able to guide the workshop attendees through VE7 in more detail and answer many questions on the new product before she concluded the session. All the attendees were amazed on how much information could be "mined" by VE7 about their PB applications! Armeen guiding Greg Winfield though his lab session. The next workshop presenter was Mr Armeen Mazda of Appeon. He first guided all the workshop attendees through installing the Appeon Developer, Server and Mobile (Appeon WorkSpace) components that make up the Appeon 2013 product. To everyone's amazment - the installation process was quite easy and everyone was soon able to run the example applications on either laptops web browser, mobile emulator (included with Appeon Mobile) or on a real Apple device! Armeen also supplied all the OSUG attendees with the latest version of Appeon 6.5.1 software while Chris Pollach also supplied a full set of his Foundation Class framework for PB Appeon so that the attendees could easily explore this web realm after the meeting. From there, Armeen focused the next workshop on building an actual simple Appeon Web and Mobile application and deploying this to the Appeon Server. Then how to actually point the Appeon Work Space (AWS) on the mobile device to the new application they just built. Again, all the attendees were able to actually build simple but real world PB applications and run these as either a web or mobile application! 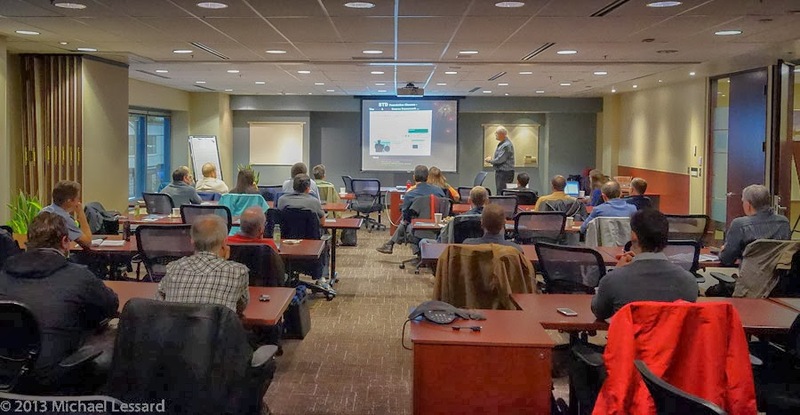 All in all, the OSUG attendees who attended both the VE7 and Appeon workshops were extremely pleased with not only the caliber of the software they received but the knowledge transfer they attained from the presenters themselves! The last presenter on Day #2 was Chris Pollach whose presentation focused on a hands-on lab for advanced developer techniques with Appeon and the Foundation Classes. Chris first walked the attendees through building a simple PB application using the Integrated Foundation Classes and then explained how to transpose that application to optimally run it as either a Web or Mobile application using Appeon. From there, Chris went into a detailed workshop on his new Web Service framework included as part of the Foundation Classes. He then concluded the workshops with a review guide on how to optimize your PB, Appeon Web and Appeon Mobile applications for the real world. OSUG would like to again thank SAP Canada, its partners, Appeon and Novalys (especially CEO Christophe Dufourmantelle for sending Anne) in helping make this PB World Tour event stop in Ottawa, Canada one of the its most memorable OSUG events ever!